Last year, I reviewed a lab coat from Pulse Uniform. I was about to start my dietetic internship and was scared, excited, etc. Now, I am done with my internship and ready to take my test to become a registered dietitian. My how time flies! I was sent a Grey's Anatomy lab coat from Pulse Uniform last year. I love this lab coat. I wore it for 15 weeks straight, everyday while I was in my clinical rotation at a hospital. This coat is good quality, looks professional, and does not stain easily. The pockets fit all of my goodies including my BMI calculator, notebook, pens, chapstick, calculator, enteral tube feeding formulary, etc. This lab coat brings many good memories to me! This time around, I was sent another Grey's Anatomy lab. 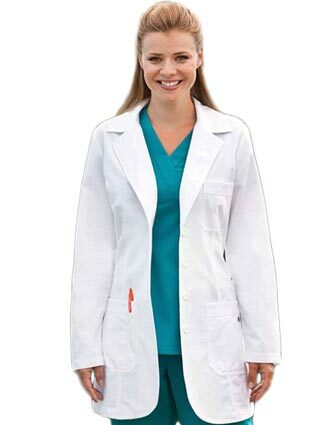 It is the Juniors 32 inch Heartline embroidery lab coat. It retails for $37. It is similar to the last one which is good because I loved how the last one fit. I do not have to wear a lab coat at my new dietitian job but will be throwing it over my outfit once it gets cooler out to warm up. I love how throwing on a lab coat instantly looks professional. The lab coat is good quality and I can tell that I will be wearing it often. Thanks Pulse Uniform!